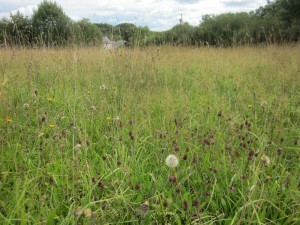 A botanical jewel, Stephen and Ann Coker’s meadows at Mountain, near Clarbeston have been chosen as Pembrokeshire’s ‘Coronation Meadow’ by Prince Charles’s project. These damp, acid meadows are a great place for orchids; with greater butterfly, green-winged and marsh orchids sometimes numbering in the thousands. Seed from here will contain a high proportion of wildflowers such as rough hawkbit and knapweed, as well as other plants such as glaucous sedge and, perhaps, an orchid or two. It would be more suitable for meadow restoration projects where the sward has already become less productive, and species like yellow rattle have taken hold. The Wildlife Trust of South and West Wales have successfully used this seed on a restoration project at their Teifi Marshes reserve and visitor centre, with greater butterfly orchid appearing here for the first time in 2017, 3 years after sowing.